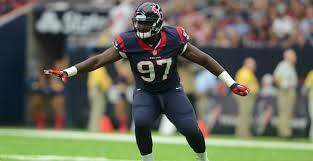 Ufomba Kamalu is an American professional Football Player who plays in the National Football League (NFL). As of 2019, Ufomba Kamalu currently plays for the New England Patriots as their defensive tackle. Ufomba Kamalu has played for other teams like Houston Texans, and Arizona Cardinals. As a defensive tackle, Ufomba Kamalu reportedly earns around $630,000 as his yearly salary from the New England Patriots. Further, Ufomba Kamalu has an estimated net worth of over $500 thousand. Additionally, he is in a relationship with his girlfriend Anna. As of 2019, Ufomba Kamalu has an estimated net worth of over 500 thousand. He reportedly signed a 1-year contract with New England Patriots in 2018. Further, the NFL player has an average salary of $630,000 annually while Tom Brady earns the highest. Further, Kamalu will earn a base salary of $645,000 in 2019 while carrying $645,000 as a cap hit. Additionally, Ufomba Kamalu so far has made earnings of $937,438 from his entire NFL career whereas Aaron Rodgers is all-time highest earner of NFL. Further, the NFL Player Ufomba Kamalu earns a good amount of money from various sponsorships, collecting a satisfactory net worth. As per his marital status, reportedly, he is unmarried. However, he is in a romantic relationship with his girlfriend Anna. Apart from the picture, there isn't any detailed information about his girlfriend in the media yet. Further, exploring his social media account, he posted a picture of his girlfriend with the caption "My biggest supporter. I love you, babe". So with the reference, we can conclude that he is enjoying a smooth relationship with his girlfriend with no news of separation. Talking about his body measurement, the Famous NFL star is 6 ft 6 in (1.98 m) in height and weighs around 300 lb (136 kg). As per his bio, Ufomba Kamalu was born on November 2, 1992, in Fayetteville, Georgia. As per his racial background, he is American and belongs to the African ethnic group. Further, his star sign is Scorpio. Talking about his education, Kamalu went for junior college to Butler Community College in El Dorado, Kansas. He attended college at the University of Miami in Florida, where he had 48 tackles( 11.5 for loss of yard), 8.0 sacks, one forced recovery and an interception which he returned for 46 yards during his three- year college career. According to his wiki, Kamalu signed on May 5, 2016, as an undrafted free agent with the Houston Texans. On September 3, 2016, he was waived by the Texans and signed the next day to the practice squad. Kamalu was signed into the practice squad of the Arizona Cardinals on September 25, 2018. Kamalu was signed into the practice squad of the New England Patriots on November 5, 2018. On December 21, 2018, he was promoted to an active roster. Currently, he is playing along with his star teammates such as Devin McCourty, Rob Gronkowski and many more.